I had the honor of chaperoning Caedon's fieldtrip this week to downtown Portland. One of the places we visited was the First Congregational Church which was built in 1891. All of the kids were pretty fascinated by the giant arches, the ornate wood carvings everywhere, and of course the amazing stained glass. 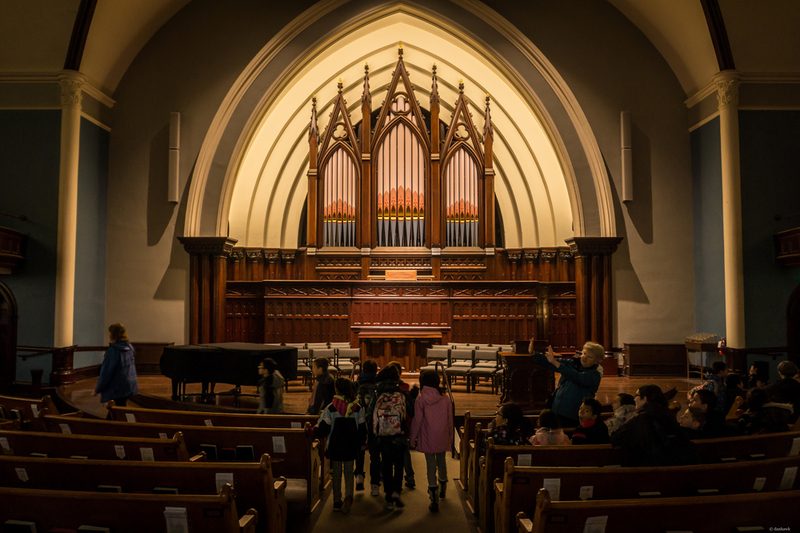 Of course, like any good church, there's a lot of symbolism built into every nook and cranny and though it was a fieldtrip for our public elementary school, we got to talk about what it all means. These images were all taken with the Sony NEX 7. The first wide angle shot is the kit lens as wide open as it goes. The other two are with the 35mm prime. As with most all of my photos, they were developed in Lightroom and the RAW files from this camera are fantastic! So much detail in the shadows!